The day after we ate the eight lobsters Hugh and I did the long walk to Kilcrohane. We agreed on the walk towards the end of the evening as with the good food and white wine something to clear the head would be good. I had to haul myself out of bed in the morning having successfully set the alarm clock. Before putting on my clothes I walked out into the garden to look at the weather. It was grey and overcast but the top of Rosskerring was clear. The walk would be on. Walking up to Cotton’s Cottage I wandered if he would be up. I suspect he was wandering, perhaps with more justification, if I would be arriving. Having established that we were both awake and that the top of Rosskerrig could no longer be seen because it was obscured by trees we set off. 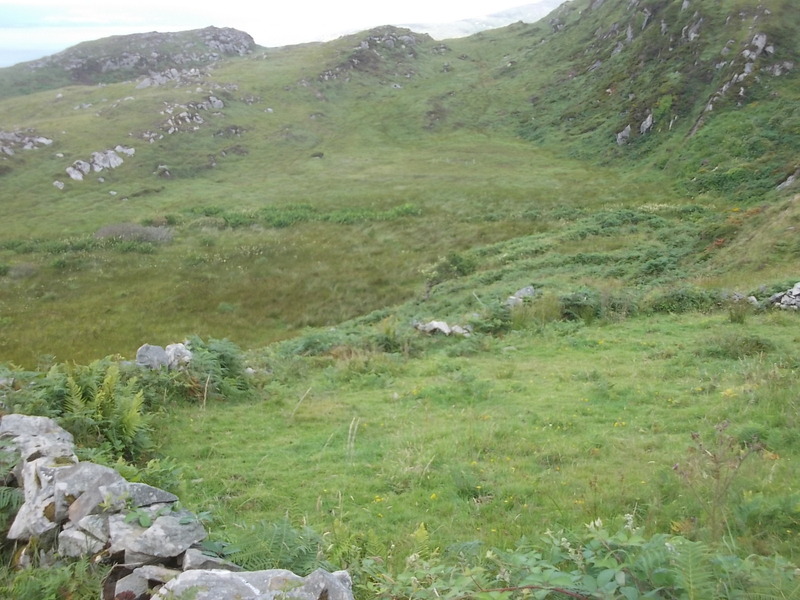 The first part of the walk was easy going up the hill past Hillcrest Farm and onto the old Kilcrohane Road. We then turned a sharp right and started the steeper ascent. As we got higher the cloud came down and the light drizzle turned into a heavier rain. We carried on stomping up the hill, following the wooden posts marked with the yellow walking man of The Sheep’s Head Way. We paused at every third or fourth post to get our breathe back and look at the view. As we got higher there was less and less view to look at. The last few hundred yards to the top felt like hard going. The wind had picked up with the height and it blew the rain hard into our faces so that each drop coming in felt sharp quick prick of a needle. The was a dispiriting feel to the walk at this point as the hill is broken up into a series of ridges. Having got to the top of a ridge there was an immediate and steep drop into a valley before having to make your way up the next ridge. Fortunately the rain eased as we got to the top. The cloud cleared so we could see the valley in which Ahakista lies and the extent to which it runs back into the hills. We didn’t stop for long but carried to get to the top of Seefin. The way here was slightly confusing and there were a couple of alternative routs which would have taken us back to Ahakista and even the way to Seefin seemed to double back on itself. Although we were still going up hill the walking was easier. The rain had stopped now but the wind was picking up. The view over Bantry Bay was all but obscured but looking back to Durrus we could just about make out the cut of the fills against the clouds. At the top of Seefin the wind had gathered itself up into gale. We both lay down under the cairn and closing our eyes it felt as if the whole hill was shuddering with the force of the wind. We then made our way down to Fin Mac Cool’s seat and the road down to Kilcrohane. The wind was now unnerving. It flattened the grass against the ground and unsteadied our feet as we tried to make our way down. It was strong enough to be able to lean back into it without falling over. I had a hat to hold onto my head which further unbalanced me. The wind was coming hard from the southwest and as we passed over onto the north side of the hill it quietened although we could still hear the noise it made in the grass, a hard angry rustle. We made it to the road and as we did so the wind eased. The walk down the road was easier than I remembered it from previous times and we got to Eileen’s pub just three hours after we had left the Cottage. Eileen was in there and worried over how wet we looked. We each had a pint to put us right and organized a lift back to Ahakista. Eileen also offered us a lift back. Rather than wait we finished out pints and started back on the road. We made it almost half way back before a car pulled up to take us back. We should have done it all on foot. We had three lobster this evening and eight last week. I thought eight was going to be a challenge to cook and in particular I had some doubt as to whether we had a pot big enough. In the event I worked it out by cooking five of them first. They just about fitted it in. Once the five were done I fished them all out and put them to one side and put the other three in the pot. By the time I had split the first five lobster the last three were done. So that could give you some idea of the timings for boiling lobster. I would say about ten minutes at a rolling boil. So that is eleven lobster done and with each one there was slight tightening in the stomach as I pushed its head into the boiling water. Doing eight in a row there was an assembly line feel with the splitting. It helps that there is now a good knife that is heavy enough and sharp enough to do the job. They were still hot from the boiling water and so I had to handle them with one hand of the oven glove. First thing to do was snip at the elastic bands holding the claws together and try catch at the small clips of elastic as they shot off around the kitchen. Then there is a thrust through the back of the head, taking the blade down between the eyes then turning it round to complete the job through the tail. Having lost all the metal crackers I cracked the claws dropping the knife down heavily until the juices leaked clear. As each one was done I added it to the plate until they were finished. By the time they were all split the slab of butter I had put into a pan with crushed garlic was done. I poured this over the lobsters. Be it eight or three we ate them with relish and glasses of white wine held in our fists. Last night I dreamt of mackerel. They were being chased into the bay and were jumping out of the water to get awau from whatever was behind them. 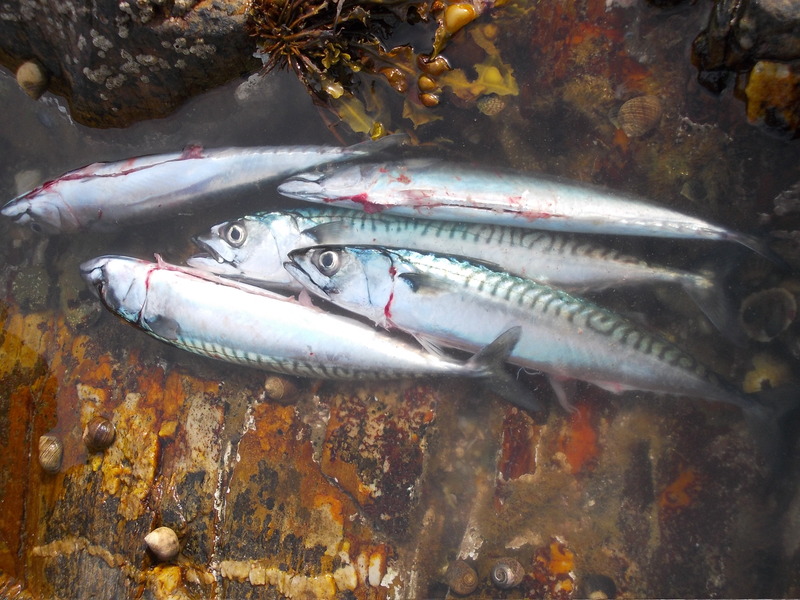 We caught about twenty mackerel on Thursday last week. I had spent some time sorting out the lines and tying up new sets of feathers. The kids kept asking if I was going to piss on them but I left them clean. We took two lines out late in the afternoon in Montbretia to the point between Owen Island and Luke’s Cottage. There was another boat out there and I motored past them before stopping the engine. Having spent that time sorting the feathers another five minutes had to be spent in the boat untangling the two lines. Once they were free they went over the side and immediately we felt a tug on one of them and we hauled in four mackerel. They were all a good size and almost as soon as they were in the boat they had freed themselves from the hooks and were in the bottom of the boat as I got the line over again. In the mean time Ben had found another line in a bucket in the boat and that went over as well. So we had three lines over the side of the boat and over the two hours we were out there almost all of the fish were caught off the one line and its set of feathers. I filleted the fish down by the rockpools. It seems that every year the gulls are getting braver in how close they will get to pick off the bits. There will be a competition as to which comes first, being able to get a gull to take something from the hand or have one come behind me to whip a fresh fillet off the plate. That night I smoked the fillets and we ate them with spaghetti and cream. The next day, Friday, I went out alone. Everyone else had gone to Doneen. 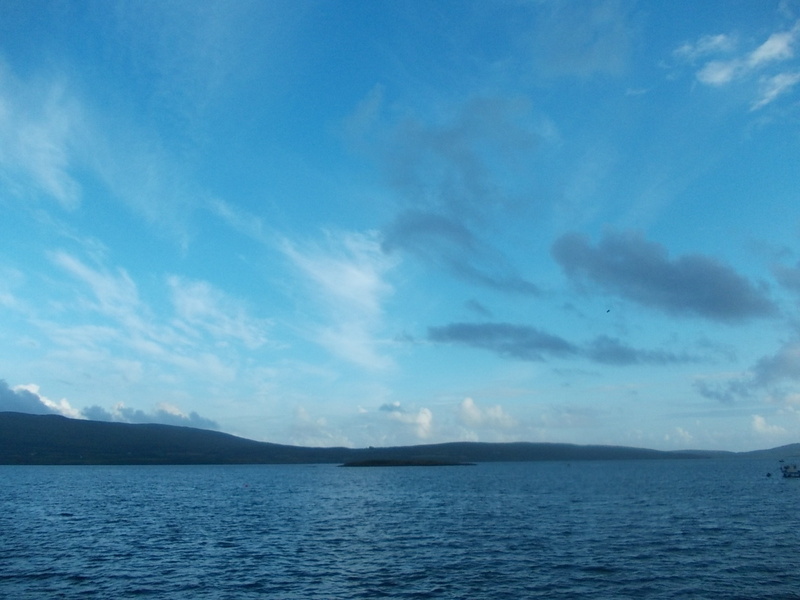 I fancied a quite couple of hours on the water watching the weather. I took with me the same line that had caught all the fish the previous day. There was no great pressure but as soon as the line went in I was hauling out fish and in the space of fifteen minutes or so I had about 25 of them in the bottom of the boat. The last few I threw back in. After that I came back in because if I carried on fishing I would have too many fish. We ate those fish on the barbeque. Two days later we went out again. This time there was a boat full including boys anxious to catch their first mackerel of the holiday. I parked the boat on the same spot I had caught all the fish two days before and past out the line that had caught all the fish to the boy most keen to catch some. I left for myself a thin reedy line on which the feathers were mostly torn off and the hooks were rusty. The lines went over the boat and we settled down to wait. I soon felt the haul and tug of fish on the line and pulled in three. The orange line was so thin it look as if it would snap with the weight of them. The line went back in and I quickly hauled in another that fell back into the water before I could grab it. In the meantime the other lines were still in the water. The line that had caught all the fish the previous few days was doing nothing. We moved the boat to another spot and still all was quiet. There were gannets in the bay dropping into the water just in front of us. We moved close to where the gannets had been and still there was nothing. There was a burst of activity when we saw a fish dart out of the water as if something had tossed it into the air. A seal’s head then bobbed out. Clearly there were fish in the water but we weren’t catching them. By now we were off Owen Island and I suggested that we should let the boat drift until we could see the Cottage and we would then have to come in disappointed. My line then trembled again and I passed it over so Tom could pull the fish in. We got it in and in the bucket and the line went over again. And then the two other lines went at once and were pulled in at the same time and all at once there were another six fish in the bottom the boat and we were all grabbing at them to give them a tap and the lines went back in again. Almost immediately they twitched again and there were another six fish in the boat. Over the next ten minutes or so we caught another four fish and so came in with twenty in all for our two hours work. We had some of them for lunch on the barbeque and ate them with our fingers sat on the grass at the end of the garden watching the weather come in. We sat in bright sunshine as rain came down blown in from a cloud on the back of Rosskerrig. I smoked the rest and we ate them as part of a kedgeree.